A relaxing day at the park is definitely a good thing to enjoy with your loving family. It's even better when you can look handsome and cool while enjoying it, and Ethan sure knows how to do it. 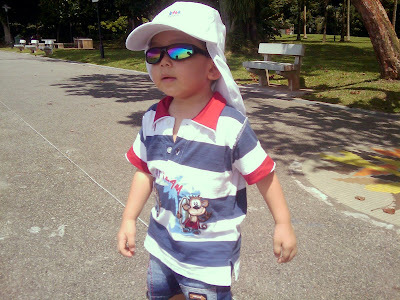 He's sporting his own shades and his BRMC Kindergarten sun hat which we brought out early. School is starting this week!! Living life as a busy toddler can be stressful, but it certainly helps when you know how to relax and enjoy yourself. This important life skill has obviously been inherited from Daddy. 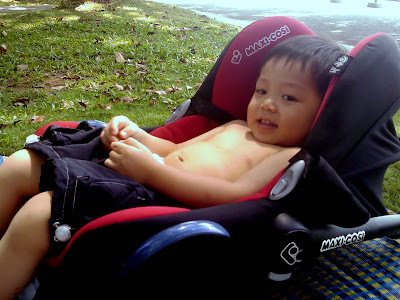 Ethan has taken a special liking to lounging in his "old car seat" when Talia has vacated it. It's a perfect armchair for him especially when he's facing the ocean and the sea breeze is blowing across his chesty chest.